Imagine the fall flavors of pumpkin pie combined with the creaminess of cheesecake. Now, add the bright flavor of gingersnaps and you've got yourself a holiday dessert destined to become a family classic. 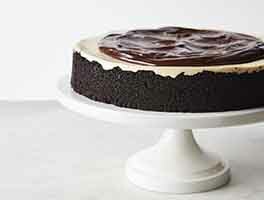 Be sure to plan a day ahead for this dessert, as thorough chilling is one key to velvety cheesecake. 5 hrs 25 mins. to 9 hrs 50 mins. Preheat the oven to 350°F. Lightly grease a 10" round springform pan. For the crust: Combine all of the ingredients in the bowl of a food processor and pulse until evenly mixed. Press into the bottom of the springform pan, and at least 1" up the sides of the pan. Bake for 10 to 15 minutes, just until you can smell the gingersnaps. Remove the crust from the oven, and reduce the oven temperature to 300°F. For the filling: Place the cream cheese in the bowl of your mixer. Blend on low speed for a few minutes, until no more lumps remain. Add the sugar, flour and spices and mix for an additional 2 to 3 minutes. Be sure to stop the mixer at least twice to scrape down the sides and bottom of the bowl. Add the vanilla and pumpkin and mix to combine. Add the eggs one at time, mixing well after each egg is added. Stir in the sour cream by hand. Pour the mixture into the prepared pan/crust and bake for 50 to 60 minutes. The cake is ready when the center 2" of the cake is still a bit wobbly. The temperature measured 1" from the side of the cake will read 170°F. Turn off the oven, prop open the door, and allow the cake to slowly cool in the oven for one hour. Remove the cake from the oven and chill, lightly covered for 4 to 8 hours before serving. 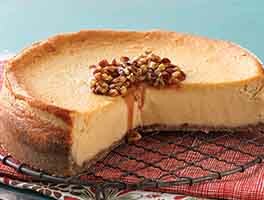 Just made this cheesecake for Thanksgiving but was dying to try it a night early (it looked that good!). My family LOVED it! 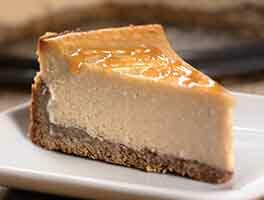 None of them are pumpkin fans, but they loved the flavor and texture and this cheesecake. The crust also added just enough ginger flavor. The only thing they said is that they wished I had made more of the crust because it barely covered the 10" pan but otherwise it was perfect. 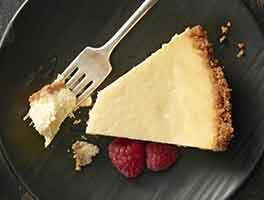 Definitely follow the tip that the cheesecake should be a little giggly in the center when it comes out of the oven. I did and no cracks! "Perfect texture, not too pumpkin-y, plus the sweetness is just right!! Bravo!" "This is the best thing I have ever eaten." "GIANT success!!!!" "We can't stop talking about this cheesecake." - Comments from my coworkers Another rousing success from a KAF recipe! Thanks so much! This is the first cheesecake I've ever made and it's fantastic. I did bake it in a water bath for exactly 63 minutes. Unfortunately, my foil leaked and some water got inside. No one can tell though! The edges of the crust are just a little soft, but there's a chance the water didn't actually penetrate the pan after all. If I were to make this again, I would probably double the crust because I like the crust on the thicker side, but everyone at work really likes it as is. I have had nothing but success with your recipes, so thank you thank you thank you! This cheesecake is delicious, and I followed the advice of another reviewer and used Trader Joe's triple ginger cookies for the crust, which was awesome. I also substituted Greek yogurt for the sour cream because that was all I had. As other reviewers suggested, I used a water bath to avoid any cracking and cooled in the oven for an hour and on the countertop for another hour before putting it into the fridge (which was successful - no cracks!). Like others, I had trouble figuring out the proper baking time, and unfortunately my cheesecake ended up undercooked in the middle. I cooked it for around 70-75 minutes, but that still wasn't enough. I have a 9-inch springform pan, which was probably part of the problem, but it seems like based on the reviews 60 minutes may just not be enough for this recipe, even with a 10-inch pan. I will definitely make this again, just need to figure out how long to bake it to make sure I end up with a fully-baked cheesecake! What can I use if I don't have a springform pan? 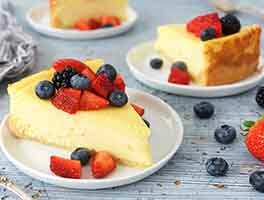 Fantastic cheesecake. I used 1/2 gingersnaps and half Nilla wafers for the crust; used a water bath and no cracking; took 60 minutes in a 9-inch pan. I also added a sour cream topping. I am definitely making this again. I made this for Thanksgiving this year, and it was a huge hit. The pumpkin really comes through, and the gingersnap crust added such a nice flavor. I used the Triple Ginger Snaps from Trader Joe's for the crust, and they have little bits of candied ginger in them that added a little extra kick. When I went to bake it, I realized that the springform pan I had was mismatched with the ring coming from one and the base from another (mixup in putting stuff in storage), so it wouldn't fit together. I used a 9 inch round cake pan instead and baked it in a water bath. I was nervous it wouldn't come out of the pan, but it did beautifully with no cracks. I also made this and froze several days ahead of time, and put it in the fridge about a day and a half before to defrost. This may have to become part of our holiday tradition! I've used this recipe about a dozen times and it used to crack every time. I resolved the issue by filing a large frying pan with water and making a water bath for the spring form pan, I also put aluminium fold around the outside of the springform pan to prevent water from seeping into it. Update to feedback posted on 11/23/16.....no cracks and the taste of the cheesecake was great. Will definitely bake again. Just took the cheesecake out of the oven..placed pan in hot water bath before placing in oven...remembered to reduce the oven to 300 degrees....not quite done so I added 7 minutes to the 60....no cracks...smells great. Waiting for it to totally cool before covering with Saran wrap...Will let you know how it taste tomorrow. Happy Thanksgiving to everyone!! !